Oral and maxillofacial surgery is developing all the time and seeks to treat and correct disturbances of the oral and facial tissues. Bone corrections (osteotomies) are generally performed intraorally. Surgical techniques (direct osteosynthesis or osteodistractions) can be performed depending on the type and severity of the deformity. Surgery can be planned in advance and guided via 3-D computer assistance. 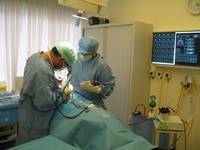 diagnosis, 3-D planning, computer guided surgery, immediate implant placement and immediate loading) are available along with a wide range of implant systems, adapted to each particular case (one or several surgical procedures). Our staff are highly experienced in treating orbito-palpebral pathologies and/or tumours (benign or malignant) of the head and neck and in all aspects of resection and reconstruction of soft and hard tissues.